Bournemouth is a city in Dorset, South West England. With about 170,000 inhabitants it is the largest settlement in Dorset and is one of Britain's premier seaside resorts with nice wide beaches and a great seafront. Bournemouth has a mild maritime climate. Summers are from June to August with average daytime temperatures around 20-22 °C and nights of around 12 °C. Winters are from December to February when it is about 8 to 10 °C during the day and nights are generally above zero. Most of the rain falls from October to January, with spring and summer being the driest time of year. Annual rainfall is relatively low, just under 600mm. Bournemouth Airport (BOH) serves the city. Ryanair has flights to/from Alicante, Lanzarote, Carcassonne, Dublin, Edinburgh, Faro, Girona, Las Palmas de Gran Canaria, Limoges, Málaga, Marseille, Murcia, Palma de Mallorca, Pisa, Reus (Barcelona and Tenerife-South. Thomson Airways serves quite a few cities as well, among which several of the above and Antalya, Bodrum, Corfu, Crete, Monastir, Rhodes, Rovaniemi, Salzburg, Grenoble and Ibiza. Bournemouth is well served by train. Trains run every half hour or so from London Waterloo (two hours); half of these continue on to Poole (10 minutes), Dorchester South (45 minutes) and Weymouth (one hour). Other trains are those to Southampton and Birmingham, at which you have to change for Scotland. The A338 dual carriageway is the main road into Bournemouth. It joins the A31, the major road in central southern England, connecting to the M27 at Southampton. From here the M3 leads to London, and fast access may also be gained via the A34 to the M4 north of Newbury, Berkshire. National Express has buses to other English cities, including London and Brighton. Other cities served are Bristol, Birmingham, Edinburgh, Oxford and Glasgow. Flightlink directly serves Heathrow airport, with connections to Stansted and Gatwich airports. 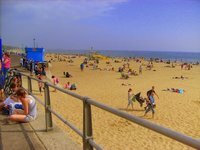 We have a comprehensive list of accommodation in Bournemouth searchable right here on Travellerspoint. You can use our map to quickly compare budget, mid-range or top of the range accommodation in Bournemouth and areas nearby. This is version 8. Last edited at 3:33 on Aug 2, 17 by sleepBot. 24 articles link to this page.